Looking for a concrete planning and levelling machine? Also known as a surface planer or milling machine, a concrete scarifier is an aggressive surface preparation machine that will chip away at concrete surfaces faster and remove old coatings. How Does a Concrete Scarifier Work? A concrete scarifier cuts, rather than grinds. How? By using tungsten blades that rotate extremely fast to create a pummelling action that chips away at the concrete surface. That’s why concrete scarifiers are a faster alternative to grinders for certain surface prep and removal jobs, such as removing more than 3mm of concrete. This will save you time, effort and money on grinding attachments. 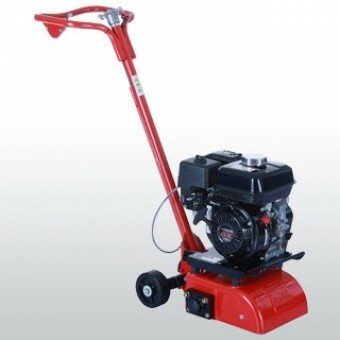 Look to a scarifier for the complete and rapid removal of trip hazards, dirty surfaces and surface coatings. They are a popular choice for floor renovations in production halls, factories, farm buildings, car parks and more. At My Generator, we stock scarifiers from trusted manufacturers, including Hoppt. Not only do we have reliable, high quality machines for sale, we sell them at very competitive prices.